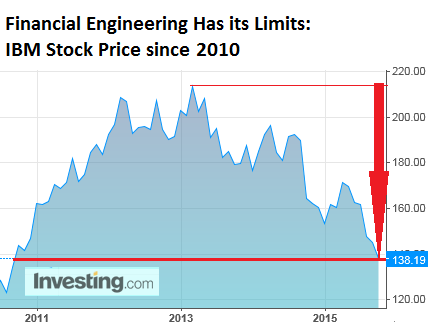 Lambert here: Invest in engineering, not stock buybacks? Crazy talk! When IBM announced earnings last week, it talked about all the great things it was accomplishing to compensate for the fact that revenues had plunged 14% from a year ago to $19.28 billion, and that even “revenues from continuing operations,” after accounting for operations it had shed, dropped 1%. It was the 14th quarterly revenue decline in a row. Three-and-a-half years! It’s not the only American tech company with declining revenues. There are a whole slew of them, mired in the great American revenue recession, including Microsoft, whose revenues plunged 12%. So they – big tech – are in this together. But turns out, IBM’s revenues, as bad as they have been, might have been subject a little more financial engineering than normally allowed. 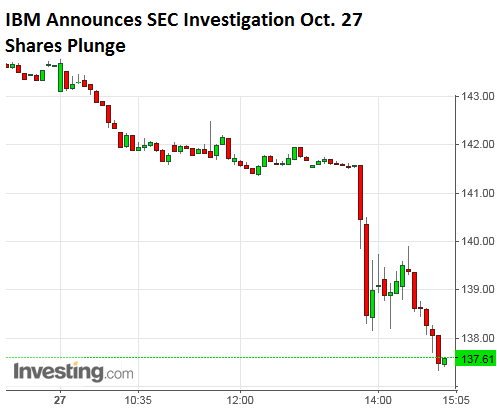 “A company spokesperson wasn’t immediately available to elaborate on the probe,” according to the Wall Street Journal. Timing was impeccable: IBM had “learned” about this debacle in August. In order not to unduly disturb its already frazzled shareholders – August was a rough month for stocks – it mercifully kept quiet about it. So today, mere hours before the disclosure, IBM announced a $4-billion stock buyback program, which brought the total current authorization to $6.4 billion, in order to put a floor under its shares in advance of the announcement. This entry was posted in Guest Post, Investment management, Moral hazard, Technology and innovation on October 28, 2015 by Lambert Strether. They’ve been up to the same behavior (the stock buybacks) for 15 years. Gutting the internal employee knowledge base, especially accounting teams, which were impeccable in the past, made a mistake inevitable. Sad. It isn’t the first software company to have been tempted by the siren call of financial engineering in an attempt to solve a revenue decline problem and I don’t suppose for one singe second it will turn out to be the last. There’s one biggie already which is well known for its, ah-hem, “aggressive” culture which already seems particularly stinky to me. As Chris in Paris rightly notes above, if you prod the zombie a little and analysed the reasons why revenue has declined, the reason is that what has now reinvented itself as a Professional Services enterprise lacks the skills and competencies which are essential to actually deliver — IBM is neither professional (amateurish is more like it) nor does it provide much of a service (unless you think the ability to gibber inanely in a heavy and largely incomprehensible Asian/Indian/East European accent is the same thing as providing a service). Even the stupidest of corporate CIOs (and they are pretty stupid, as a whole, it’s only taken them about 10 years to have spotted this decline) eventually realises that people get fired all the time for buying IBM because of the, well, general crapness. This isn’t even the first time IBM has done something like this. Back in the late 80’s, IBM leased the majority of its mainframes. Someone came up with the bright idea of converting those leases to sales. Income jumped and bonuses were paid for the next 5 years. At that time, there were no more leases to convert and sales plummeted. Stock buybacks aren’t necessarily bad. Whether IBM should invest in growth depends on its investment opportunities. If (as it appears) IBM is basically in long-term liquidation (a la Xerox) as its 20th century mainframe technology fades from the scene, then stock buybacks are a more tax efficient way than dividends to return capital to the shareholders, until it’s all gone.
. . . then stock buybacks are a more tax efficient way than dividends to return capital to the shareholders, until it’s all gone. Would it be more or less tax efficient if IBM just gave up the ghost, and had a fire sale auction of it’s assets instead of waiting till it’s all gone? But no management team has ever elected to go that course. If just the Board would take action. Snap, back to reality. It’s still a $140 billion company in market cap, so the number of potential buyers is limited. IBM’s corporate culture would be a good fit with Microsoft, I reckon. I was thinking more along the lines of say having Ritchie Bros Auctioneers come in and sell the physical assets. There must be some interesting machine tools that IBM is misusing that would be more “productive” in someone else’s hands, no? The service side of the business could be sold off piece by piece. IBM looks like the individual parts are worth more than the whole. I completely discount the $140 billion market cap as a pure Fed enabled fiction. IBM Corp. on Wednesday confirmed the purchase of The Weather Company, which includes the Weather Channel and its related technology platforms and sensors, to enhance its cloud ecosystem. IBM said the purchase adds to the $3 billion investment IBM committed earlier this year to build out products and services in the Internet of Things. It’s all too likely that a simple semantic error — confusing white puffy clouds with high-tech electronic ones — has led to a tragic misallocation of capital. Tata or Wipro would be a better suitor. IBM already has a large number of its employees outside the US. I remember an academic paper from some years ago demonstrating a negative correlation between share buy-backs and future stock prices. The obvious explanation is that such financial engineering is attractive to management only when all other options (organic growth, attractive acquisitions) have either been tried, and/or are unappealing. In other words, it’s usually sick companies that resort to it. Well, it probably depends on the time frame and the cohort. If I can dig up that old study I’ll post it. The S&P 500 Buyback Index is up 7.5 percent this year through Oct. 3 compared with the 6.5 percent advance in the S&P 500, after beating it by an average of 9.5 percentage points every year since 2009. Buybacks increase leverage. It’s not surprising that companies shrinking their equity base (often while simultaneously enlarging their debt) outperform in a bull market. Presumably these same companies will get smashed harder when we finally (like Thelma and Louise) drive off the edge of the Permanently High Plateau. As S&P points out, there’s an ETF for that. Two of em, in fact. uybacks increase leverage. It’s not surprising that companies shrinking their equity base (often while simultaneously enlarging their debt) outperform in a bull market. Correct. Buybacks increase the risk of the equity by changing the capital structure. They are helpful to a certain extent to eliminate the dilutive effect of employee stock options, but beyond that they add no long-term value of the company. Yes, I agree with you on the effect of shrinking the equity base. It increases equity vol. IBM could also return to selling CD ROMs of installable SPSS instead of looking for subscription junkies. Refresh my memory: What does IBM do these days? Make less money as time goes on. I’m typing this comment on a pre-Lenovo IBM ThinkPad. And I’m remembering the days when IBM actually made things that were good to own. Y’know, like this laptop. Considering the numbahs, Wolf Richter is much too charitable in this piece IMO. Where are the debt rating agencies?… back in the same bars they hung out in back in the day? And does the SEC have authority to investigate beyond accounting treatment of matters like revenue recognition? IBM is far from the only major corporation where this behavior, which also serves to maximize gains under executive stock options, has been occurring. Negative $19 billion tangible net worth and very high debt leverage after massive stock repurchases and high dividend payouts over a period of years. Wonder what will happen if interest rates ever rise? … Oh, but Look! !… The stock is up this morning! “The Market” has spoken. All is well, people!… Move along. Is IBM still in business? I didn’t know. Microsoft next in line? I’m a little confused – on one hand the author is saying that IBM has been “pulling a bag over investor’s heads” by tricking them with faulty per-share metrics. One the other hand there’s a chart of IBM that shows that the stock is flat since the end of 2010 – a period where the broad market is up over 60%. There was certainly a period where IBM did well in that time, but that was largely on the expectation that they were actually turning the business around and taking steps to, you know, try and grow the thing. When that failed to materialize, the stock rolled over. I don’t disagree with the author that financial engineering in general is hardly the panacea Wall Street makes it out to be, but I think investors as a group deserve more credit for figuring out what’s really going on. I’ve worked on IBM midrange servers for most of my adult life (since 1991). Hope they don’t endanger that. The real problem is that colleges and universities stopped teaching mainframe technology two decades ago-so now we have to do the education ourselves.